Haiti shares an island in the Caribbean with the Dominican Republic. Its capital city is Port-au-Prince. 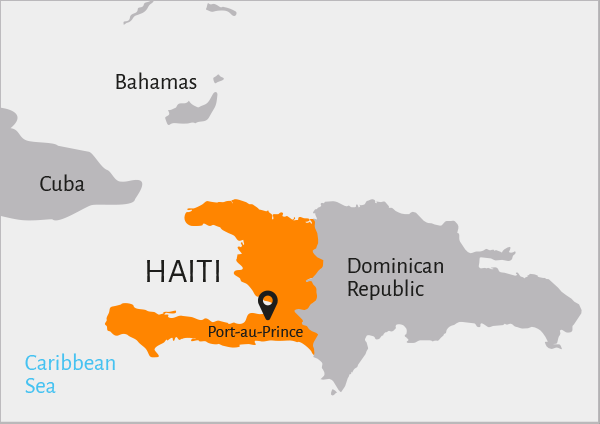 10.5 million people live in Haiti, and its official languages are Haitian Creole and French. A quarter of the population live in extreme poverty, meaning they live on under $1.25 a day. A devastating earthquake in 2010 killed more than 316,000 people and left 2.1 million people homeless. Most people (79% of the population) live in the countryside. Over half of these people do not have access to clean drinking water. Only 49% of adults can read and write, and over two thirds do not have a formal job. Only about 10% of all children at primary school go on to high school.